You don’t have to live with bad credit. Although the idea of improving your credit might be scary, it can be done. First, start by discovering what’s affecting your credit score. Secondly, take the basic steps to minimize the issues. Finally, start building some positive credit to your credit profile. Hiring a credit repair company might be an option, but make sure you get the facts before you hire one. That entails thorough reviewing of your credit reports from all three major credit bureaus, Experian, Equifax and TransUnion not just one, (I repeat not just one, but all three). And see where your credit score stands. If you’ve never ordered your credit reports and credit scores before, 2013 is a great time to do both. Did you know that all your lines of credit and loan payments and non-payments are gathered into a distinct file known as your consumer credit report profile? Did you also know that the information accumulated in this report can be calculated and accessed a mathematical value called a credit score? Your credit reports and credit scores are the two main methods that creditors and lenders use to make a credit decision in order to extend you credit. When you apply for any type of credit, rather it is a credit card, they check to see if you have a history of late payments on credit cards. Mortgage lenders check your credit report for previous loan defaults. Even utilities like water, electric, gas and cell phone companies check your credit report before granting your service or requiring a large deposit. Your credit reports include information about where you live (past and present addresses), where you work (employment history), credit rating (on-time payments), whether you’ve filed bankruptcy (Chapter 7, or 13), and if you’ve been sued (un-paid judgments), if you owe back taxes (federal or state tax liens). Your report is maintained by all three major credit bureaus – Equifax, Experian, and TransUnion. The information is compiled and sold to businesses who want to view the information to make a credit decision about you. The Fair Credit Reporting Act, FCRA, limits the businesses that can access your credit report to those that have “permissible purpose”. Your creditors and lenders send information about your accounts to credit bureaus. This includes monthly payment status, account balance, credit limit, account status, and any other information that can be used to determine your creditworthiness. Once the information appears on your credit report, it’s available for future creditors and lenders to see. Checking your credit report periodically is imperative for maintaining financial and good credit health. You can obtain a copy of your credit report by contacting any of the three credit bureaus. The FCRA allows you to order a free copy of your credit report from each of the three credit bureaus each year. Your credit score is a mathematical rundown of your credit report, since it’s a number, creditors and lenders can easily assess your credit risk to make a decision about extending credit to you. 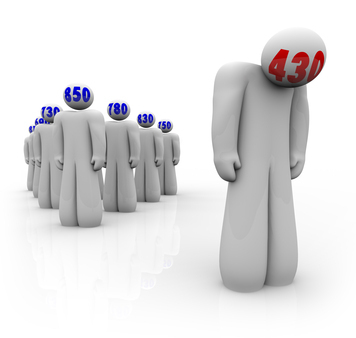 Credit scores range from 300 – 850. Consumers with higher credit scores are measured to be less risky borrowers than those with lower credit scores. Higher credit scores allow you to get lower interest rates on credit cards and loans, lowering the cost of having credit. Consumers with low credit scores usually have higher interest rates and might be denied for some credit cards, loans, and other credit related services. There are numerous methods of credit scoring and some lenders even have their own credit score. The most widely used version of the credit score is the FICO score, named for Fair Isaac Corporation, the company recognized for developing the score. All three major credit bureaus have their own version of the FICO score. Equifax uses the Beacon system, Experian uses the Experian/Fair Isaac system, and TransUnion uses the Empirica system. Even though the systems are different, each produces comparable scores.